Looking around and observing the world about you is central to drawing and painting yet it is all too often that attention is drawn to the paper or canvas, and not to the thing that we are attempting to reproduce. ‘Blind Drawing’ aims to address this and, in doing so, lead to a better awareness of the link between what happens when we look and what happens when we put pen to paper, so to speak. The exercise is simple and involves setting up to draw your image with a piece of paper and charcoal laid out on a desk in front of your subject. From then you will need someone to place a large sheet across the desk, with you sat ready to draw, charcoal placed upon paper. The aim of the exercise is to draw you subject (still life, landscape, or portrait figure) as it appears in front of you, whilst all the time maintaining a focus upon that subject, with no temptation to look at your hand upon the paper as you draw (a temptation that will in any case be thwarted as you will not be able to see the paper, or your hand!). 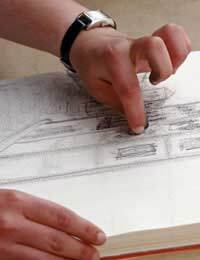 Only after a set amount of time are you allowed to remove the sheet from your hand and look at the paper, and even then you are not allowed to alter the drawing any way. The result you will see will possibly surprise you on the account that it will probably resemble your chosen subject more than you could have reasonably expected, and less than you might have hoped! What the exercise aims to teach is that perception (in the process of seeing) is linked directly to hand movement by the brain and that they are both essential partners in producing an painting or drawing. For part two of this exercise you are asked to now to spend an equal amount of time drawing the scene in front of you, but now by memorising the scene and conducting the drawing (on a new sheet of paper) by looking only at your hand, your stick of charcoal (in your hand) and the sheet of paper you are using. The end result will again be in some respects both worthy and disappointing! What both of these drawings together will now demonstrate is that often one thinks they are looking when really they are not! In all probability, the drawing conducted looking at your hand and sheet of paper will be more refined than that conducted looking only at your subject, yet it will bear no real resemblance to your subject. In contrast, that conducted looking at the subject will be less refined, yet may entail elements that bear e fleeting resemblance to the subject. When we draw or paint, we look at something, which is reflected as light on to our retina, before being processed in the brain as information, which in turn is formed into an image. From there, signals are sent to the hand telling the hand to make lines that accurately depict the image that we are seeing. The success of that image depends on a constant update of data both from the subject that is being depicted, via the brain and to the hand, and from the image being drawn, back to the brain, where it is compared to the subject that is being drawn. This reciprocal interaction is one that grounds the artist in the world around them and ensures that the artwork is not just an outpouring of their own impressions, but a work borne of a relationship between the artist and the wider world. The exercise above is called ‘blind drawing’ because it shows that when we do not take both the paper and the subject into account (when we are not comparing our own results with the world as it appears to us) we end up with a poor result, as if we are drawing blindly’.